Now this one is really hard to explain. In fact I needed it explained to me a few times before I really got it. Firstly in the United States, in 1965 there was a film called Dr. Goldfoot and The Bikini Machine, which starred Vincent Price as a villainous character called Dr. Goldfoot. In that film, Goldfoot made ‘girl-bots’ (it would be a few years until the term ‘fembot’ was coined) to seduce the world’s wealthiest men, and acquire their fortunes. Also in Italy, during 1965 a film was released called Due Mafiosi Contro Goldginger (AKA: Two Mafiosi Against Goldfinger), which starred Italian comedy duo, Franco Franchi and Ciccio Ingrassia. 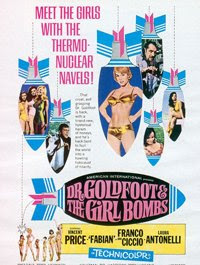 Dr. Goldfoot And The Girl Bombs (1966) or Spie vengono dal semifreddo (The Spy Who Came In From The Semi-Cold) as it is known in Italy was made to be a sequel to both of them. Obviously, they were edited slightly differently to make the content more relevant to their specific audiences. I have never seen the Italian version, but I have been told that it is slightly better than the American version. But that couldn’t be hard as the American version is pretty terrible. Granted, the Goldfoot films were never intended to be more than cheesy light-hearted fair, but film lacks the one essential ingredient for all comedy films – namely comedy. This is the type of film that attempts to get laughs by speeding up the film and adding cartoon sound effects. But I’ll be brave and soldier on. Seven NATO Generals are due to meet in Rome for a series of wargames. But before each of them arrives, each of them is sent one of Dr. Goldfoot’s Girl Bombs. The Girl Bombs are beautiful, life-like girl robots, but if you kiss them, they explode. And this is exactly what the NATO Generals do. Boom. One assassination takes place at a hotel where Franco and Ciccio are working as doormen. When Goldfoot walks in, he is discreetly followed by Bill Dexter (Fabian). Dexter is an agent for the Security Intelligence Command (S.I.C.). Franco and Ciccio, for reasons known only to themselves, beat up Fabian, bind and gag him, and then drag him into the hotel’s bathroom. Meanwhile Goldfoot’s Girl Bomb explodes upstairs. Franco and Ciccio realise they have made a mistake and release Dexter, and follow him back to S.I.C. Headquarters. Here Franco and Ciccio get inducted into a spy recruit program. Later, Colonel Benson (Francesco Mulé), the head of S.I.C. utilises the latest computer technology to select the two best operatives to investigate the deaths of the NATO Generals. Unbeknownst to Benson, Dr. Goldfoot is watching and listening to his every move. Goldfoot, crosses the wires in the computer, so rather than spitting out the names of the best agents, it gives the names of the worst, yep, Franco and Ciccio. So now, Franco and Ciccio have to stop Goldfoot, whose plan involves impersonating the last NATO General, who he happens to be a dead ringer for. Buried under all this mess, there is a spy story. It’s a plot by the Chinese to take over the world. It’s the usual America and Russia destroy each other, leaving China as the dominant world power to take over. But having said that, if you’re a fan of spy movies, I wouldn’t go hunting for this one. Even if you’re a Mario Bava fan, I’d steer clear. This isn’t worth your time.